Yes, I am finishing with a BANG!!! But let's start at the beginning. 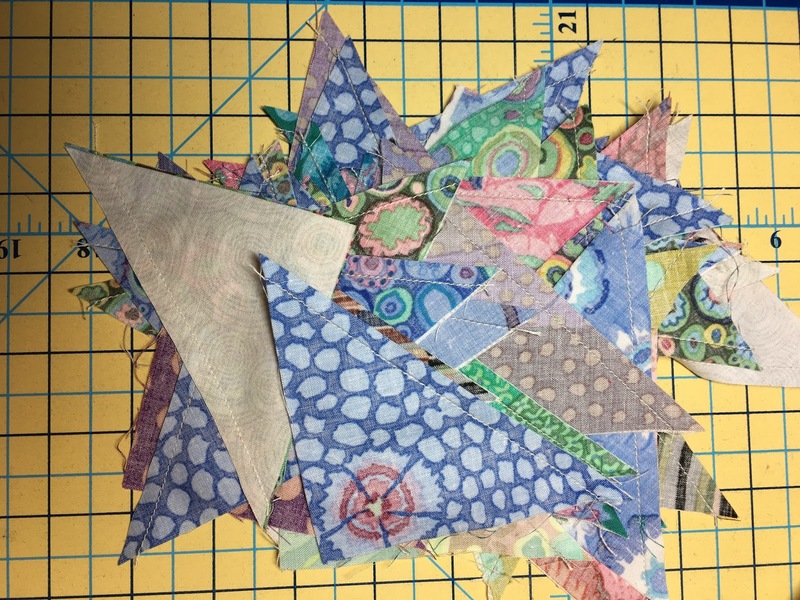 The mission was simple - Use up 124 HSTs left over from making Clay's Quilt. I turned to Pinterest for ideas. There were a few that appealed to me. Arrange 120 HSTs 10 by 12, sew and call it a flimsy. Some design is bound to emerge. Right? I liked the idea of simple. I wanted to get it done. Bernie and Mari had warned me that if I let them sit too long they would become a UFO. Quick and Simple. Who does not want that? But it does not have that spice, that lure, that attention-grabbing, passionate tugging at my heartstrings effect. Have you had that moment when you are so consumed by it that you forget almost everything else. I was not getting THAT feeling. One Saturday morning, Paul asked me to accompany him to Chick-Fil-A. No, not exactly a date but he had a coupon for a free breakfast sandwich. Oh well. Me: There is no such thing. Paul: Are you a sunflower? Me: You must be a vampire, seeking the darkest corner. Chick-Fil-A employee - We do not serve blood. I also got something to eat. Did not care for it. Can you believe a breakfast place that does not serve hot tea? I mean it is just hot water. It is less work than coffee. I was feeling trapped and restless while Paul lovingly lingered over his potatoes. Boredom can be a beautiful thing. My mind drifted back to the 124 HSTs waiting for me at the ironing board while I was trying to eat bland eggs. Here is some salsa, Paul offered. I glared at him but accepted the salsa. My thoughts drifted again. 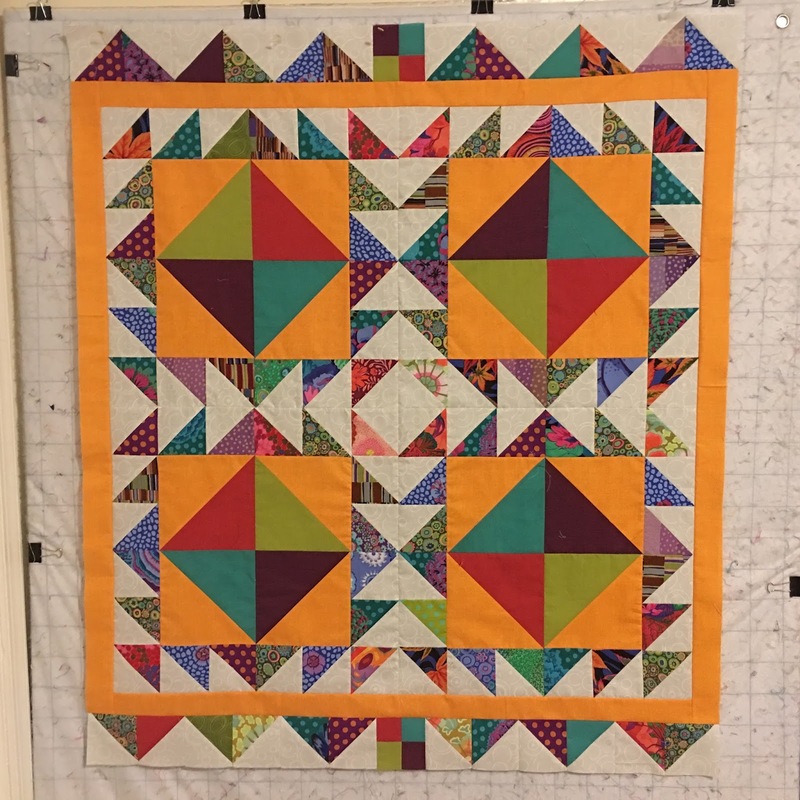 This time to a beautiful pink/orange quilt I had seen at allpeoplequilt.com a while ago. Composed of HSTs, what was its name - Ships something. 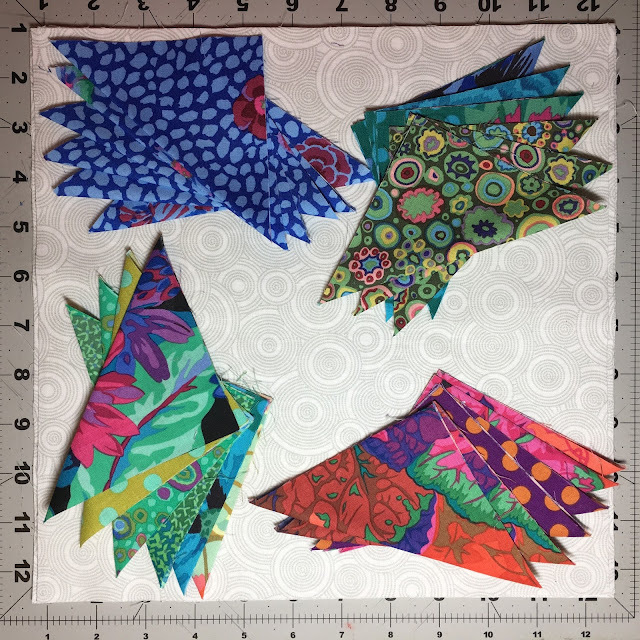 I have a lot of little HSTs. 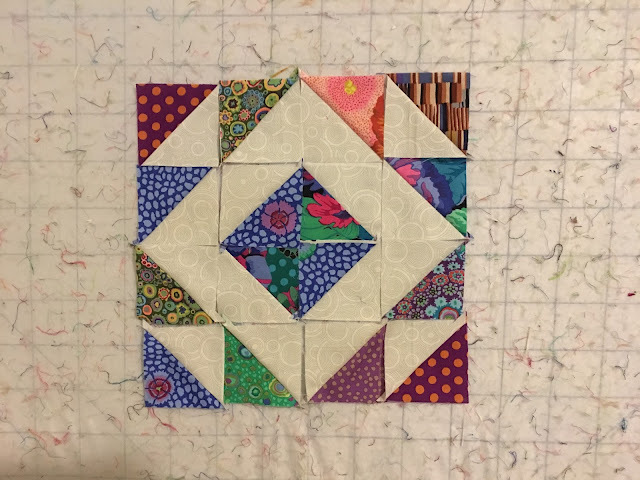 So if I made a few larger ones (one large for every five small ones), I could make this block. And then that feeling came - like a thief that is so close to the treasure that his fingers begin to tingle. Now, I had to drop everything and make it. I still had leftover HSTs. 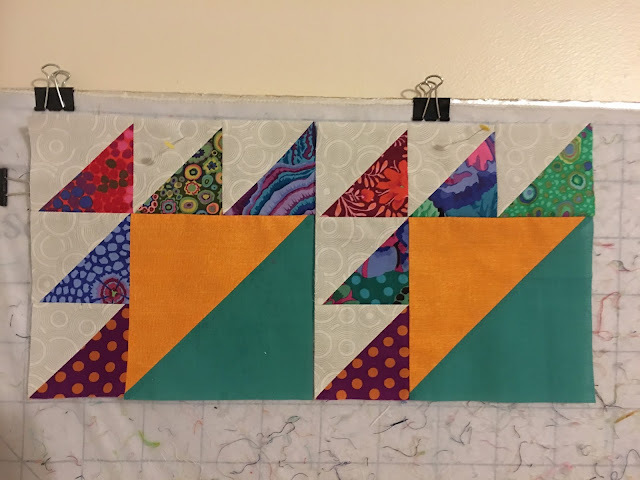 A border of HSTs? Maybe. But they have to fit right. This required an internal border. 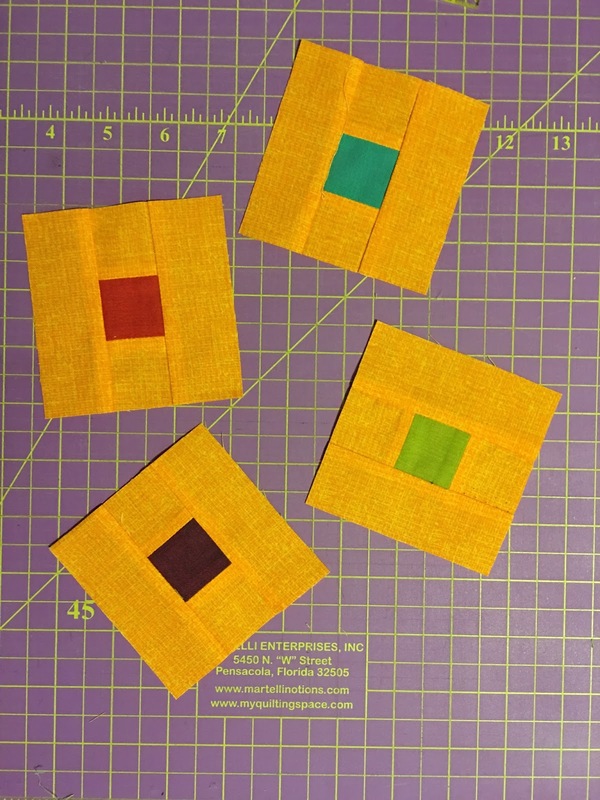 And cornerstones, and tiny 4-patch blocks in the middle of the borders to make sure that everything falls in the right place. The flimsy was complete. Well, almost. 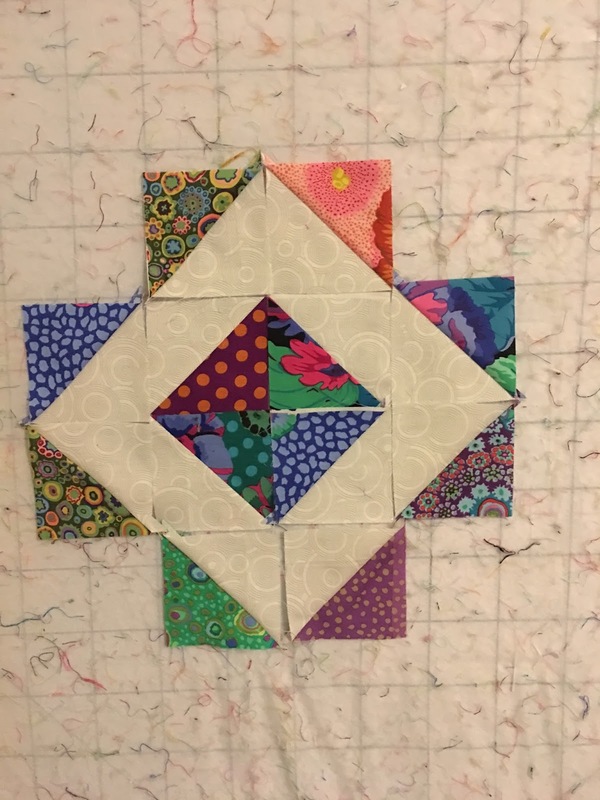 I added a skinny background border to make sure that the binding did not eat up the points of the HSTs. Starting from that one block (1 large+5 small HSTs), the rest of the quilt came together, almost effortlessly, in a round robin fashion. It is as if the quilt just made itself. 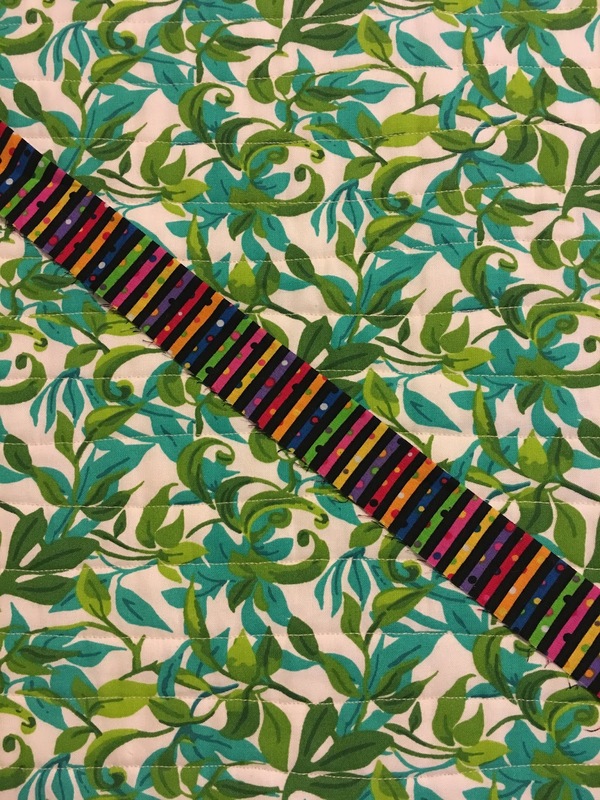 I chose a this green print for backing. And the binding contrasts beautifully. Here it is!!! My 20th finish of 2017. Can you see the sliver of background between the binding and the points of the HSTs? A little dusting of snow made for a perfect backdrop. But I had to take a break in the middle of the photo-shoot. I came inside to regain sensation in my fingers before venturing out a second time. 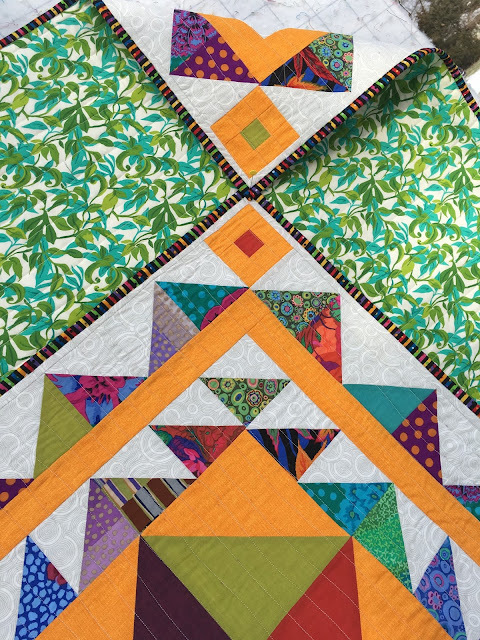 This quilt reminds me of the bright tents (shamiyana) at a traditional Indian wedding. The colors are so much like my traditional jewelry set - green, gold and red. 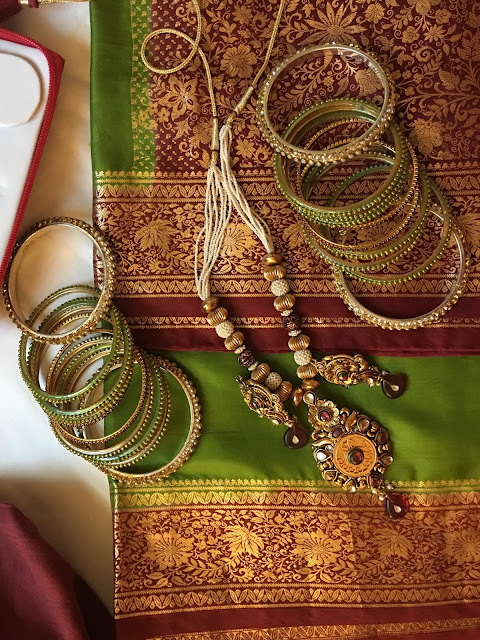 These colors are also reminiscent of India's Temple Silk sarees. The pattern is like a Rangoli, made at Diwali to welcome the Goddess Lakshmi. The flying geese units are circling around the larger HST clusters. Distilling all these thoughts and ideas, I have chosen to call it Parikrama. Parikrama is the path that devotees follow, going around the temple to mark the end of the worship. Parikrama finished at 46" square. It seems fitting that I end the year with this quilt, just as a devotee would end the worship with the parikrama of the temple. As usual, I'd love to hear your thoughts. 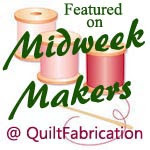 I will be linking with all my favorite linky parties, listed on the sidebar. Also linking with Sandra's Dreami. Hope you stay warm and I wish you all a very happy new year. Beautiful, as ever, in every way. 2017 closes with a bang! This is absolutely gorgeous! You are an outstanding quiltmaker. Gorgeous! I love it when a quilt makes itself.. Happy New Year! Love this quilt -- great that it uses up leftovers!! You have out done yourself this time! 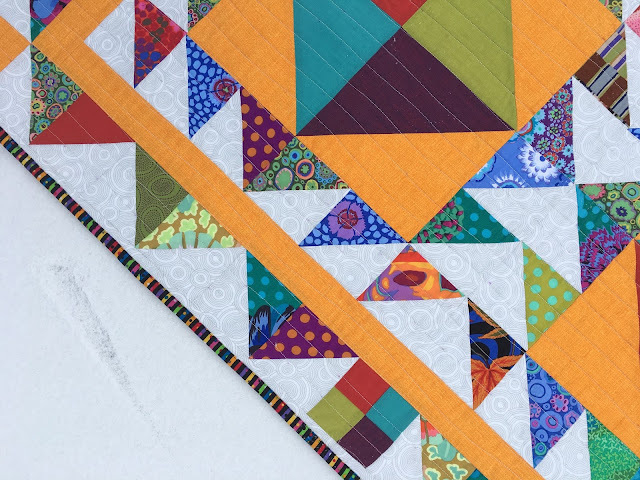 The addition of the solids makes this quilt so beautiful. Hope to see more of you in 2018. Gorgeous goddess of a quilt! 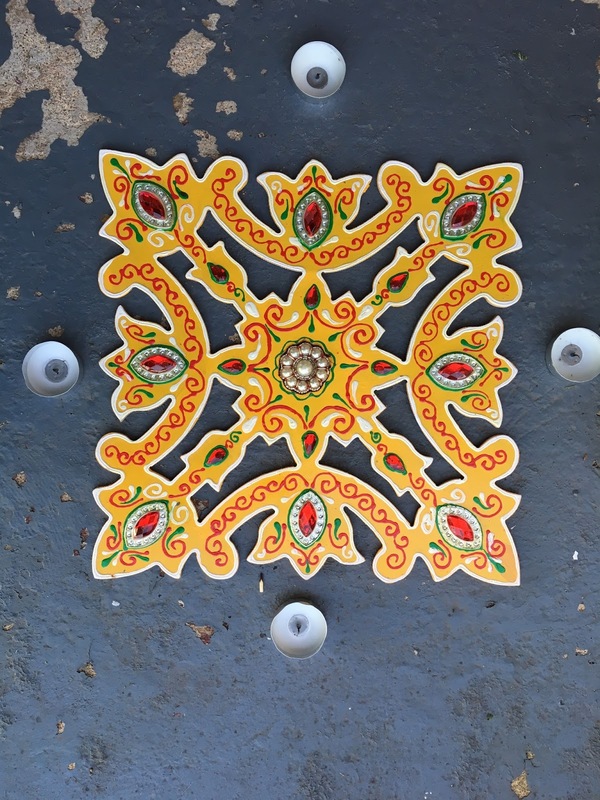 What fun you had while creating this rich and warm beauty. Love the binding too. Thanks for taking us on your creative journey. Happy New Year! What a beauty. Wishing you a wonderfully creative New Year. Preeti, I love this quilt! You have such a GREAT eye for design and color! 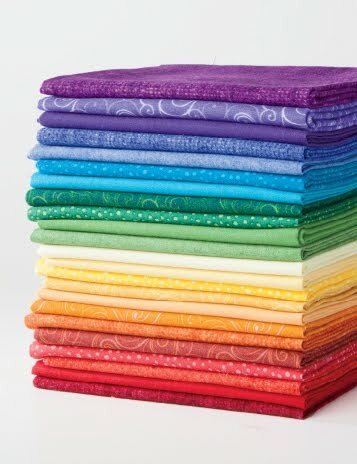 Did you already have these solids in your stash or did you have to go buy them? They go so perfectly with your Kaffe scraps! 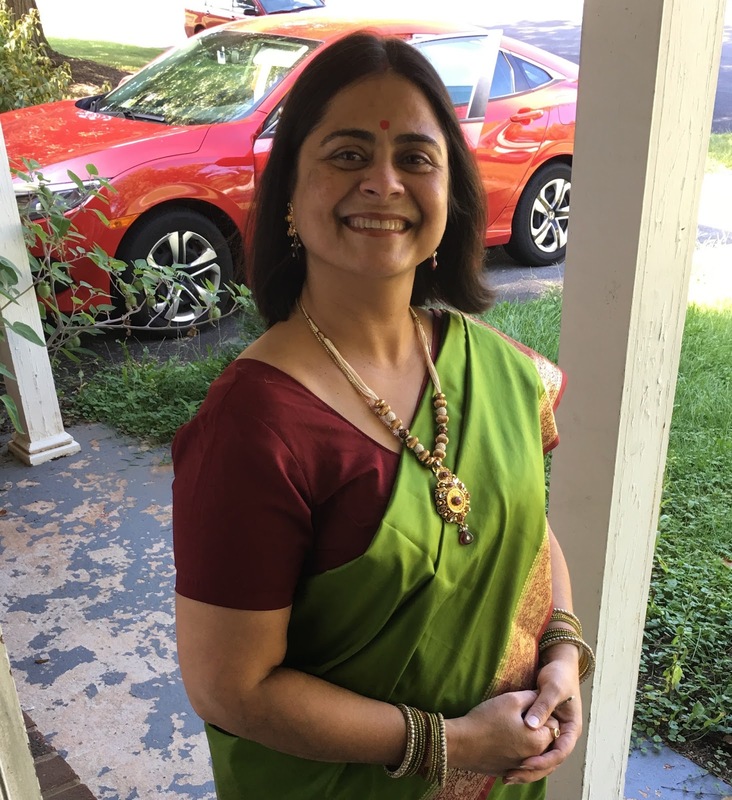 This is a beautiful quilt, Preeti! I loved the Kaffe HSTs right off the bat, but when you added the orange fabric (maybe that would be called cheddar?) it really became a "Wow!" Congratulations on a great finish for 2017! It's amazing. Thanks for sharing how it came to be. I love the little border to save the points. Magnificent! And you make it sound so easy! Oh that is wonderful - I really appreciate that you stepped out the process for us. The use of cornerstones and the four patch in the centre of the border makes such sense! As does that little sliver, thank you so much for showing us. This is a special finish. Your quilt is wonderful. Stunning colours and a great design. Love the way you were able to use up all the triangles. Happy New Year! 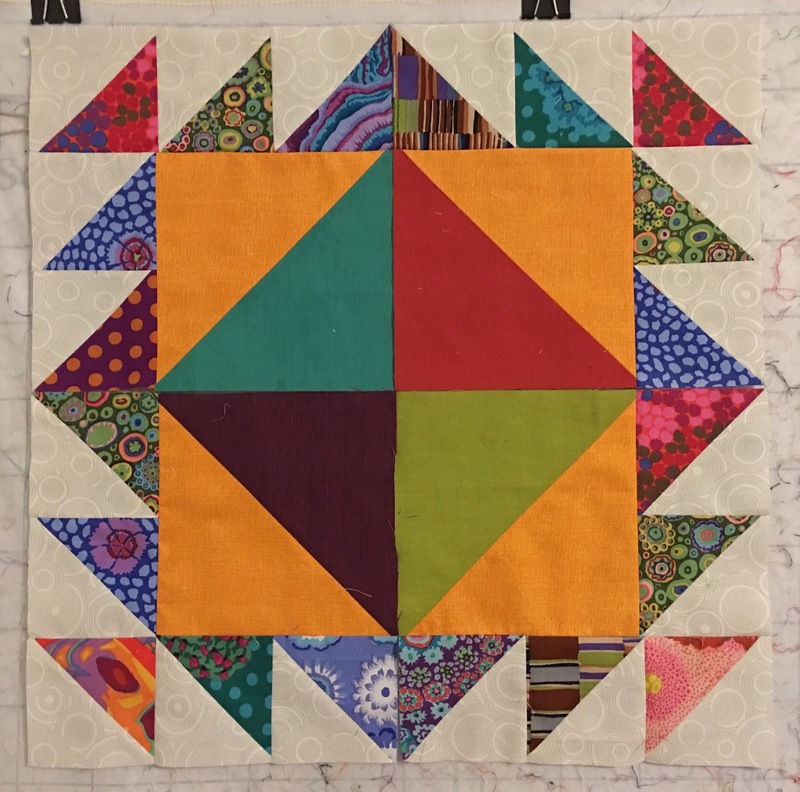 Your quilt is wonderful and it as interesting to read how it all came together so beautifully. 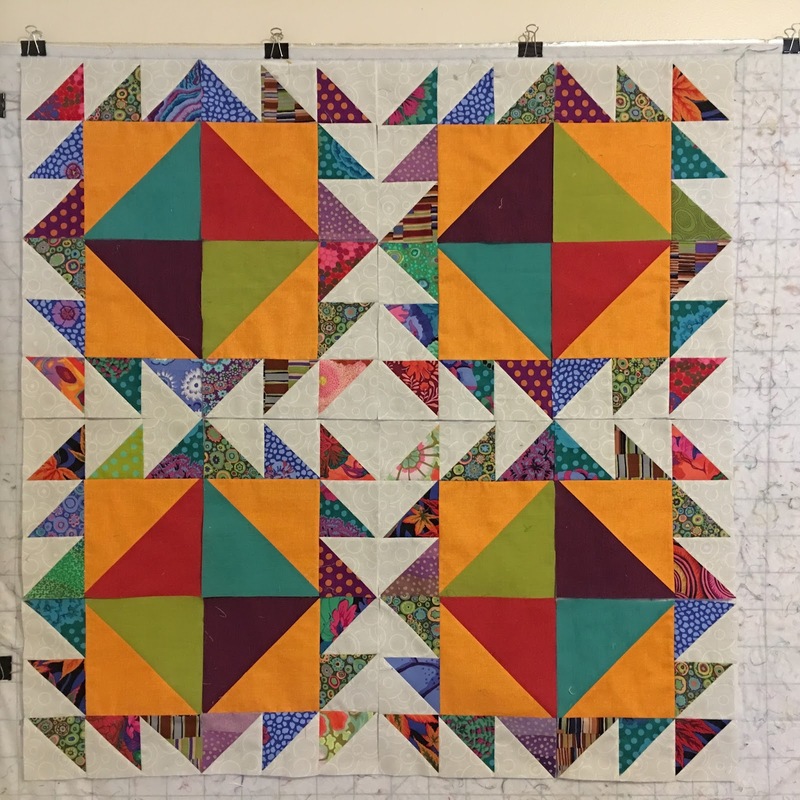 It is the first quilt I have looked at in 2018 as I decided to have a quick blog browse before I started some stitching. Best wishes for a super stitching 2018. Wow, what a fabulous quilt!! I like seeing your process. Pretty much the perfect quilt to end 2017 with! Love that you weren't feeling it until you were feeling it!! Sometimes it takes a little time away to come up with the perfect solution! I love it!! A beautiful finish for 2017! 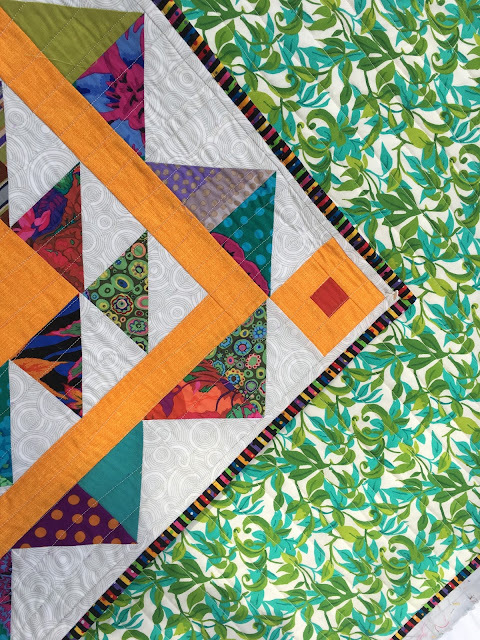 Love the colors and how you pulled all the inspiration together to create the quilt. It's always such a good feeling when you get it "right". Happy New Year to you and Paul. What a great finish!!! It is so gorgeous!! Yay you - Happy New Year! A bright lovely finish. I'm really appreciate your perfect points. I'm just a little jealous, I don't like that word let's go with envious. I don't like that one either. Hmmmmm...let me think ab out this. Okay, I got it, you inspire to be more precise with my points. 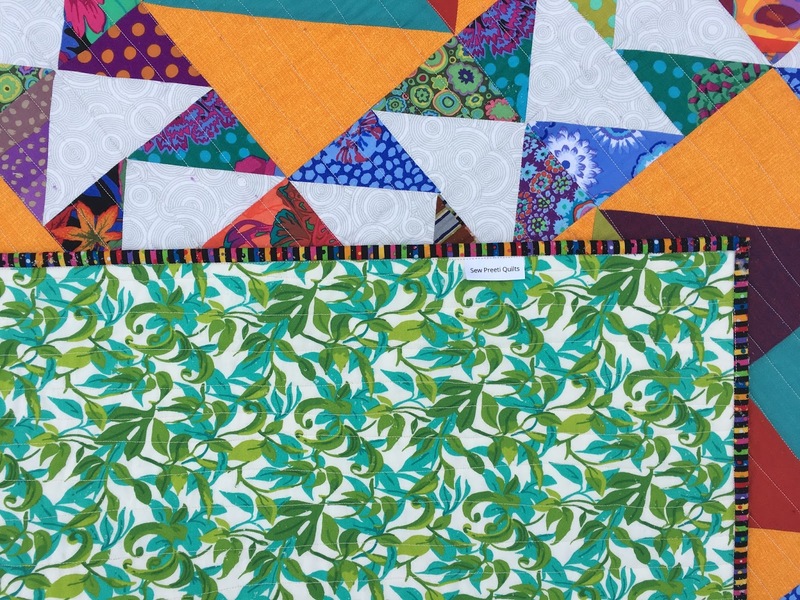 This is such a great quilt, Preeti! It reminds me of you-- vibrant, happy, and bright. Happy 2018! 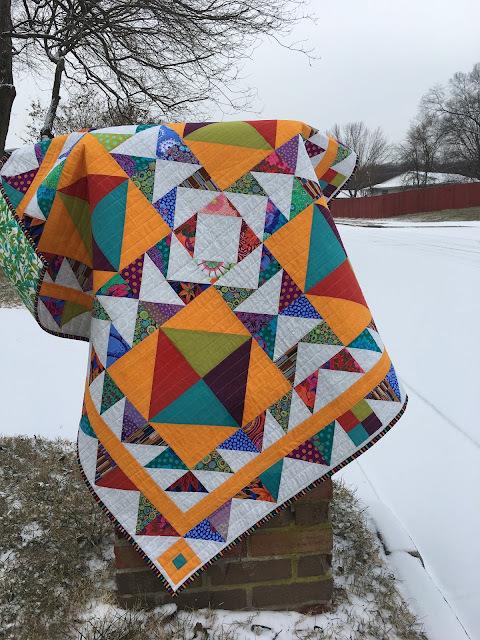 I cannot believe how the addition of the bright solids transformed the quilt and process to make it a spectacular DrEAMi! I had always heard that cheddar makes a quilt pop--well this is certainly a case in point. And I think that bit of snow was a gift to show it off in all its glory. What a wonderful celebration of the end of the year and a beautiful way to start the new year reading your blog. Happy New Year! 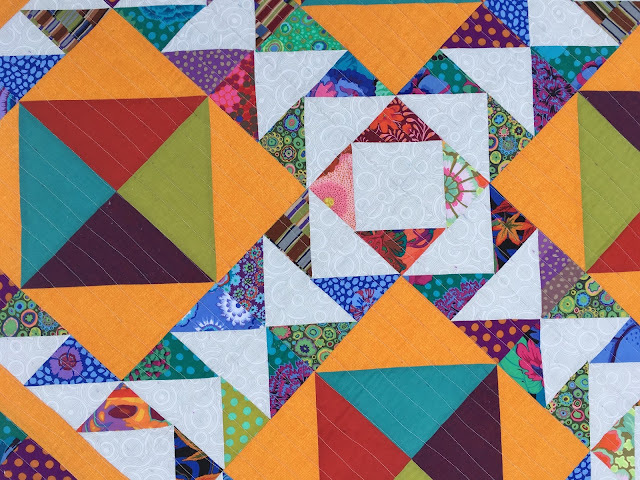 This is the perfect quilt to end 2017 with! 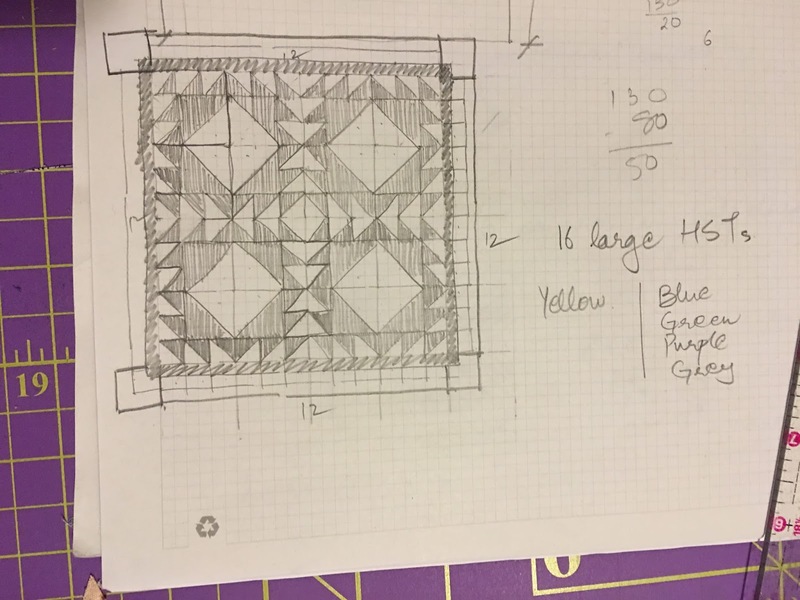 I love the way you describe your design process and seeing it come together was so much fun. It's gorgeous, and the binding is like the icing on the cake. Perfect! 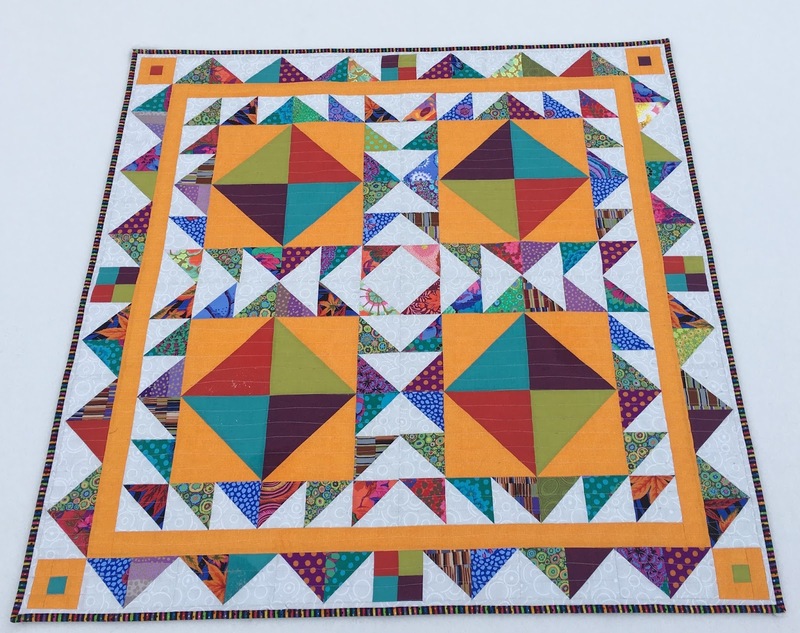 Thanks for sharing your quilt on Main Crush Monday! Your quilt and your writing style are awesome. You took me along on the journey. LOVE this quilt!! I'm a real fan of Kaffe and love how you combined the solids with these leftover hst's. Great job! It's beautiful, it has a very balanced and restful sense of completion about it. Is the symmetry, the balance of larger and smaller HST? Or the pattern of courtyards surrounded by walls? I don't know, but it gave me a sense of peace, a lot like the walled walkway you get in Catholic convents (often with a garden or courtyard divided in 4 quadrants in the middle). I will keep the idea of a "kloostergang" quilt in mind for 2017, but for now I am enjoying handquilting my Splendid Sampler and I have started a small Easter project. I am glad I found your blog in 2017 and hope to keep visiting this soulful blog in the year to come. OH. MY. GOODNESS!! 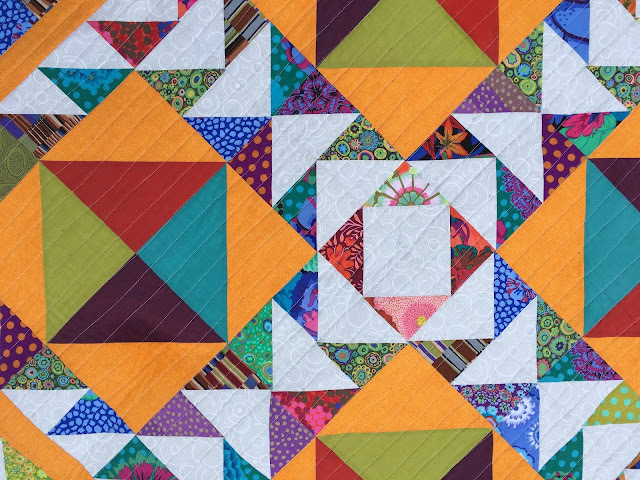 Yet another stunning quilt you've created. 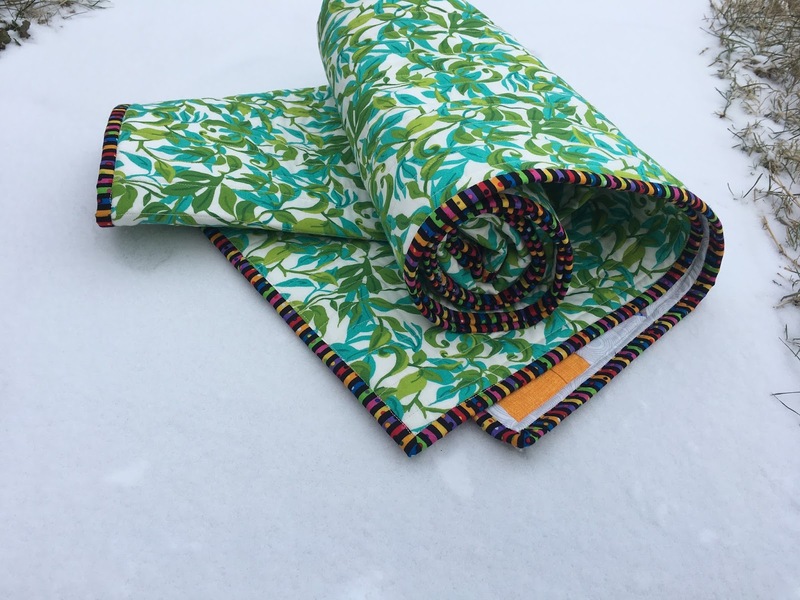 I love how the Kaffe Fassett prints are set off against the solids and tonal white print, and that glorious cheddar yellow is just perfection. I love how you tell the whole story of the quilt, what it reminds you of, and how you named it. Very similar to a post I wrote today, although I only have a finished top and not a finished quilt to show for myself just yet. It's a good thing you were bored at Chik-Fil-A; this design is worth a bland breakfast without any tea! It’s wonderful! Thank you for the visit to my blog and your sweet comment. My great-granddaughter is s little shy and in a new place. Trying to help a little, there will be more favors to go with the journals. I really love your quilt, makes me want to be a copycat and give it a try. This one's a beauty! 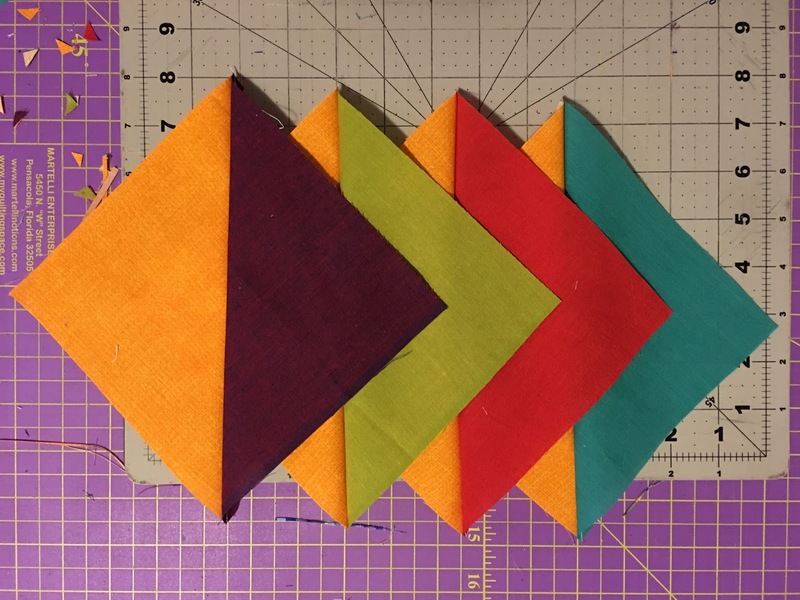 Great job incorporating solids with the Kaffe's - thank you for sharing! 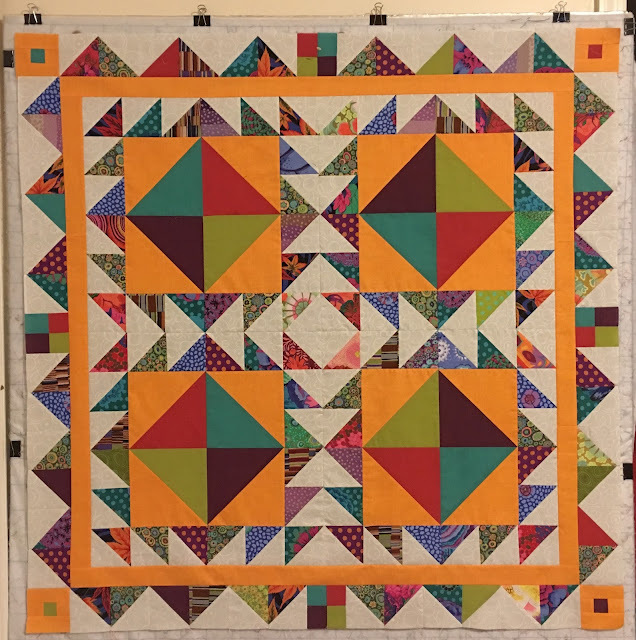 What a beautiful quilt, thanks for sharing! That's a lovely "last" finish! I cherish reading through your process because your storytelling is so captivating and I am glad you changed the approach in between. It is just so much more personal this way! WOW. Your process was explained so well, in amazing detail. I admire that you took the time to photograph and describe it. What a magnificent quilt. It is really stunning. I have read this blog post several times, finding your story and photos so satisfying. The backing and binding fit so well And the name is perfect. You really have a talent for naming. Well Done! What a veritable feast of colour, oh how can I have missed it? Better late than never. I loved to story of it's conception and I love how you named it. I will look forward to seeing what your imagination dreams up next. That's just gorgeous! And you just figured it out in your head??? Very impressive.